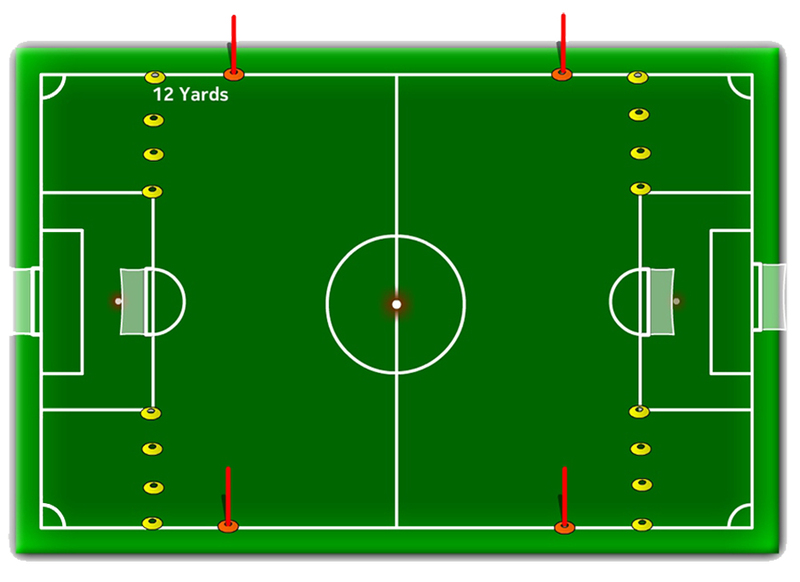 Pitch layout, as below, from edge of penalty area to edge of penalty area. Small goals to be used (Please ensure that they are secured properly to the ground). “D” on penalty area is used as goal area for goal kicks. Small flat cones to be used to mark bye line from edge of penalty areas to side lines. Taller cones to be placed on sidelines 12 yards from edge of each penalty area. This will give a penalty area of 12 yards out by the usual 44 yards wide. Penalties to be taken from 10 yards out. Games are 9 a side. Panels of 16 players maximum allowed for each game. Substitutions can be made in the normal way at times when game is stopped, referee will oversee as usual. No limit on number of substitutions, and players who had been taken off can be put back on. Size 5 (370 gram) ball to be used. Normal game rules to apply including offside. NB – all clubs MUST ensure that the “D” is lined properly on both penalty areas.